When the weather is wet and soggy, it is my habit to remain indoors pottering about all day. Only when I am forced to, I exit my artist’s version of the man cave (okay, honestly, it’s really my studio and there’s no television in it). I suppose, left alone, I would never come out of doors. I could spend my time working on my website, working on a new illustration, completing my current commission. I always have a legitimate excuse for remaining in the cave. 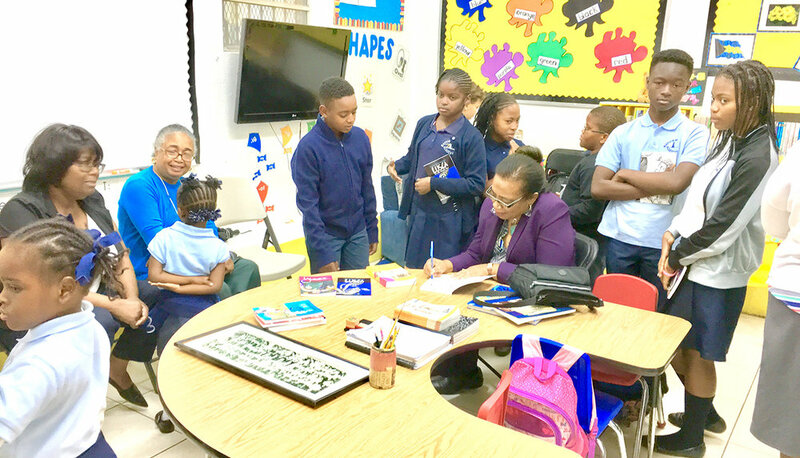 But these days… because of our mission to encourage more Bahamian students to get reading, and because “I gone with my fas’ self”, and obligated Guanima Press Ltd to giving away thousands of books to students, I can no longer ignore the world outside. I must get up and go out there, and work on completing what we started. The past week, Wednesday, with fancy Mac-in-a-sac plastic hooded jackets, spring-loaded umbrellas and eco-bags of books in each hand, we braved the wet, soggy weather, and headed for Bayview Academy on Augusta Street. We had a mission to accomplish. We had Patti’s new book to put in the hands of the fourth, fifth and sixth graders there. Of course, being atypical Bahamians, we got there at 10:30am for our 11:00am presentation and, would you believe, they, atypically, were ready for us. We were met at the door by the principal, Elva Armbrister, and immediately ushered into the room. The students were quickly brought in to fill the chairs there. Their first question to Patti was when did she start writing. If anyone knows her they know the answer to that—she was always writing for as long as she could remember. She joked about having read the word “mechanical” in a book as a child and, although she did not know how to pronounce it, decided she would use her new-found-word in an insult aimed at her aunt. She proudly said “gone with your “masheenical” head. She was, of course, mortified when instead of having the expected outcome, her insult was met with peals of laughter because she had pronounced it incorrectly. In the wonderfully crowded and informal setting, Patti answered several questions from the students and teachers for some time, while we awaited the arrival of Mrs Orry J. Sands (our featured sponsor for this particular school visit). When Mrs Sands finally arrived (on time), it was my turn to take the floor. I wanted to leave the students with examples of Bahamian readers. Bahamian readers who had accomplished or were accomplishing great things. I told them about Mrs Sands, owner of Orry J. Sands and Co; Dame Ivy Dumont, first woman Governor General of the Commonwealth of The Bahamas; Archbishop Patrick Pinder, leader of the Roman Catholic Archdiocese of Nassau; our son Robin Glinton, VP of Data Science at Salesforce, a Fortune 500 company and major comic book reader and, of course, I did not forget to mention the author of the book being gifted to them—Patricia Glinton-Meicholas. Since embarking on our mission to put thousands of copies of our book Lusca and Other Fantastic Tales in the hands of students for free, we have had wonderful visits with Patti’s alma mater The Government High School and their librarian Linda Fisher. Patti read to the ever-grinning, expressly-affectionate children of Thelma Gibson Primary School. These charming youngsters gathered around our truck, as we were leaving waving us goodbye (Their smiling faces are forever locked in my memory). We watched wonderful performances put on by the children of the TARA Xavier Hepburn Foundation and the Indaba Project. We attended Thanksgiving mass and then addressed the entire Aquinas College where we gifted every student in the school with a copy of the new book. Am I sorry that I now have this new “duty”, which forces me to leave my man-cave on a regular bases to deal with the chaos and din of the wild Nassau streets? The rewards have been extraordinary and, what is more, if we can help if only one child to realize the importance of reading, and the significance of spending their entire life learning, then we have accomplished our goal.